As CHIP Funding Runs Low, States Warn Insurance Could Lapse : Shots - Health News Funding for the Children's Health Insurance Program expired in September. Millions of children could lose coverage, unless Congress acts soon to restore the money to keep the program running. 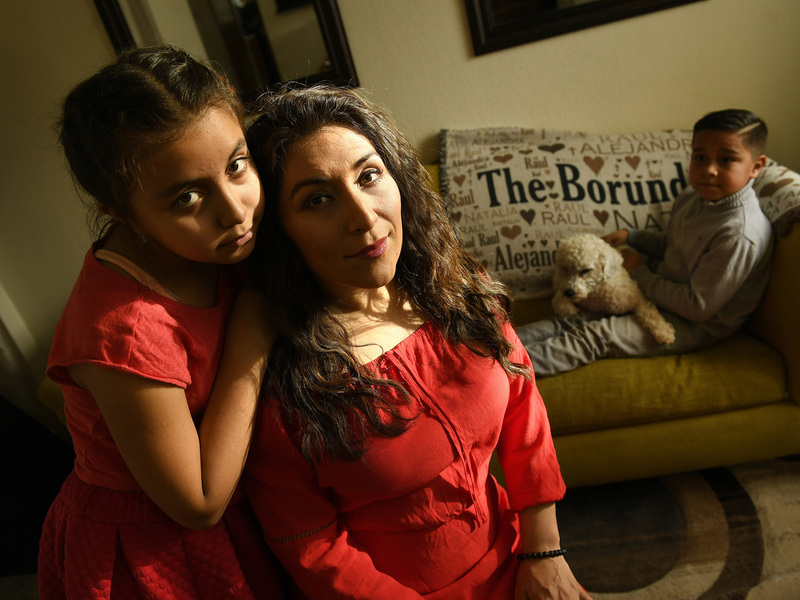 Alejandra Borunda, sits with her two children, Natalia, 11, and Raul, 8, holding the family dog at their home in Aurora, Colo. Borunda's children are among those who would lose out if the CHIP program isn't funded. This week, Colorado became the first state to notify families that children who receive health insurance through the Children's Health Insurance Program are in danger of losing their coverage. Nearly 9 million children are insured through CHIP, which covers mostly working-class families. The program has bipartisan support in both the House and Senate, but Congress let federal funding for CHIP expire in September. The National Governor's Association weighed in Wednesday, urging Congress to reauthorize the program this year because states are starting to run out of money. In Virginia, Linda Nablo, an official with the Department of Medical Assistance Services, is drafting a letter for parents of the 66,000 Virginia children enrolled in CHIP. "We've never had to do this before," she says. "How do you write the very best letter saying, 'Your child might lose coverage, but it's not certain yet. But in the meantime, these are some things you need to think about.' "
Children may be able to enroll in Medicaid, get added to a family plan on the Affordable Care Act's health exchange, or be put on an employer health plan. But the options vary by state and could turn out to be very expensive. If Congress reauthorizes CHIP funding, states are in the clear. But they can't bank on it yet, and states have to prepare to shut down if the funding doesn't come through. Virginia would have to do so on January 31, 2018. "We're essentially doing everything we would need to shut down the program at the end of January," Nablo says. "We've got a work group going with all the different components of this agency, and there are many." For example, they will need to reprogram their enrollment systems, inform pediatricians and hospitals, and train staff to deal with an onslaught of confused families. Joan Alker, who runs the Georgetown University Center for Children and Families, says most states need to give families 30 days' notice. "But [state officials] are hearing rumors that Congress might get this done in the next couple of weeks and they don't want to scare families," she says. "States are really in a bind here, it's very tough to know what to do." Colorado was the first to send out a notice and other states are close behind. There are a handful that are starting to run out of money in December, Alker says, such as Oregon, Minnesota and the District of Columbia. The exact deadline for when CHIP funding runs out in each in each state is tricky to calculate, because the amount of money they have depends on how fast states spend it — and how much stopgap help the federal government gives them. Some states are getting creative. Oregon just announced it will spend state money to keep CHIP running, says Alker, "And they're assuming that Congress will pass it and they're get reimbursed retroactively. That's what they're hoping." Texas is set to run out of CHIP funds a lot sooner than was expected just a few months ago. And there's a big reason for that: Hurricane Harvey, says Laura Guerra-Cardus with the Children's Defense Fund in Austin. "Natural disasters are often a way that individuals that never had to rely on programs like Medicaid and CHIP need them for the first time," she says. Guerra-Cardus says after Harvey, a lot of new families enrolled in CHIP and there was also a higher demand for services. "When there is such a traumatic event, health care needs also rise. There's been a lot of post-traumatic stress in children," she says. And to help those families out, Texas officials also waived fees they usually have to pay to join CHIP. So, lately there's been less money coming in and more money going out. Like Virginia, without reauthorization, Texas would have to shutter CHIP by the end of January. For Amy Ellis in Alpine, Texas, that's something she's dreading. "Losing a lot of sleep," she says. "Still losing a lot of sleep." Ellis has an 8-year-old daughter who has been on CHIP since she was born. She has asthma and allergies. Ellis says health insurance is really important because her family doesn't make a lot of money. Her daughter's allergy medicine is expensive. Ellis lives in rural West Texas, nearly four hours southeast of El Paso and "three hours from the closest city," she says. The isolation means that Ellis doesn't have a lot of options other than CHIP, she says. One would be enrolling her daughter in the insurance plan she and her husband have through the Affordable Care Act marketplace, but Ellis says that would be expensive. "It would cost $300 to $400 a month for us to add her to our plan, which would be a huge chunk of our income," she says. "That's our grocery money and our gas money." A lot of families in Texas could find themselves in the same situation if Congress doesn't act soon, says Guerra-Cardus. "Kids with chronic or special health care needs, this is going to turn their lives absolutely upside down." Roughly 450,000 children are covered by CHIP in Texas. Officials say they are asking the federal government to give them money that will keep CHIP alive through February. But because officials must give families 30 days' notice if the program will end, families in Texas could get letters right around Christmas that say their children are losing their health insurance.